Shimon Mishkal stepped unsteadily across a rocky beach toward the Sea of Galilee. Israel's only natural freshwater lake, it is 13 miles long and seven miles wide, an expanse of blue surrounded by flat-topped, arid mountains. It's known in Hebrew as Kinneret, or "harp," because of its shape. It's where the Bible says Jesus recruited four fishermen as his first disciples and fed a host of people with five loaves of bread and two fish. For more than 40 years, Mishkal, now 85 and retired, came to this beach each morning to read a gauge measuring the lake's depth. He reported his findings to anxious water officials down south in the nation's capital, Jerusalem. "The whole country waited for my measurements," Mishkal said. "There was a time the water dropped by four meters. Do you know how much we cried then? It was a real heartbreak." Mishkal's measurements were broadcast nightly on the TV news because the Sea of Galilee was for many years the country's major source of water for drinking, agriculture and industry. The wellbeing of Israel could be calculated by the level of the Kinneret, the saying went. In a country that is 60 percent desert and the rest semi-arid land--and is adjoined by hostile neighbors--water security is national security. Today, the lake level is measured by an electronic system but, more significantly, it is no longer a national obsession. In a region where water access contributes to increasing tension and strife, Israel has essentially solved its water scarcity problems by desalinating Mediterranean seawater, recycling wastewater and getting the most crops out of the fewest drops. While the water supply in the West Bank and Gaza remains less reliable, the lessons Israel has learned are being watched by other drought-prone regions, including California. Water was a national security issue for Israel from the beginning, when it was founded in the wake of World War II. Periodic droughts struck the country as its population and its industrial and agricultural sectors grew rapidly. A severe drought in the 1990s led to a water crisis and to technological innovation. The Jordan River feeds the Kinneret from the north, originating in Syria and Lebanon and bordering the Kingdom of Jordan. All three nations were enemies when the British Mandate expired in 1948 and Israel declared statehood. A long-running dispute ensued over who could draw water from the Jordan and how much. 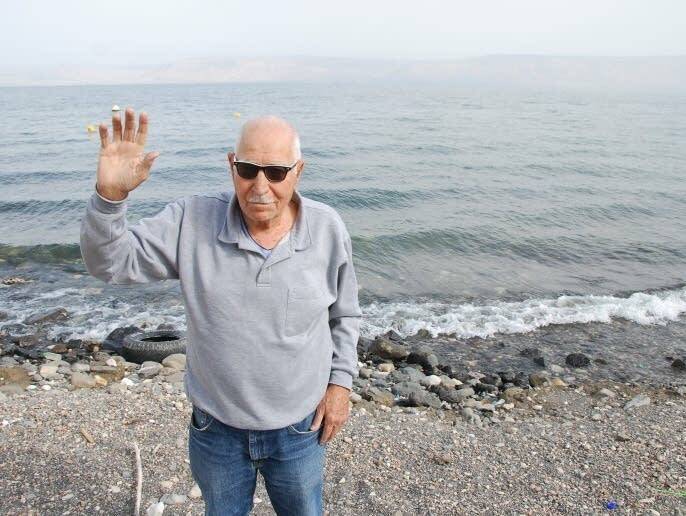 Shimon Mishkal remembered trekking to measure the water level of the Jordan River north of the Kinneret in the early 1970s. He says Syrian troops fired on him and his colleague as they approached the river, and his partner was shot dead. Helping manage the Kinneret was a way to serve his country, Mishkal said. "I loved my job. I didn't do it for money. It was a mission," Mishkal says. But the dry spell lasting from 1998 to 2002 drastically depleted the Kinneret as well as the country's major underground aquifers. In response, the government banned washing cars with garden hoses and encouraged people to take shorter showers. It focused on recycling sewage and wastewater to irrigate farm fields. Israeli seed companies became leading developers of hybrid crops that required less water to grow. It also launched a $2 billion program to build five massive seawater desalination plants, the most recent one going online in 2015. Now, more than half of the fresh water used in this nation of 8.4 million people comes from the sea. One of the newer desalination plants — said to be the largest of its kind in the world — is the Sorek facility south of Tel Aviv. It pipes water from the Mediterranean, runs it through a series of filters and returns a salty concentrate to the sea. The process, which uses a technology called reverse osmosis, takes about 20 minutes from when a given drop of water enters the plant. Impurities are removed from the water by sand filters, an age-old technique. 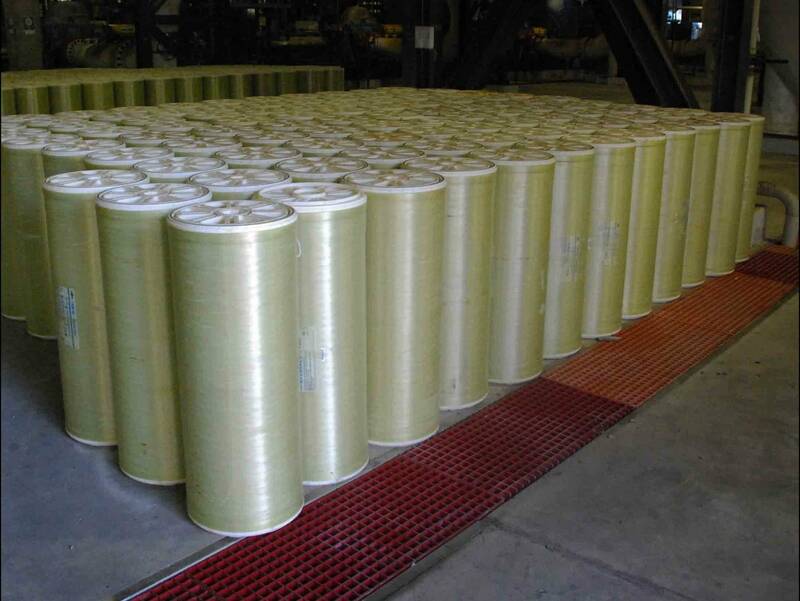 Then the water is forced at high pressure through coils of tiny polymer membranes that trap salt molecules. Calcium carbonate and other minerals are added back to the purified water to give it taste. Sorek was built and is run by IDE Technologies, on contract with Israel's Water Authority. "We are technology leaders in desalination," said Miriam Faigon, senior director for technical solutions and products at IDE. "We work worldwide. We have 400 units installed in 40 countries." That includes a $1 billon desalination plant on the California coast providing water to San Diego. IDE is helping to plan at least nine more desalination plants in the United States. Critics of desalination note that the process is energy intensive and raises environmental concerns because of the extremely salty water returned to the sea, and the killing of fish and other marine life sucked into the plant and killed by its filtering system. The seawater solution has led Israel to neglect the maintenance of its groundwater resources, said Sarit Caspi-Oron of the Israel Union for Environmental Defense, an NGO. "More than 300 drinking wells have been closed in Israel due to pollution," she said. "The way the water economy has been managed over the years has forced us to become dependent on energy-guzzling desalination instead of sustainable sources." 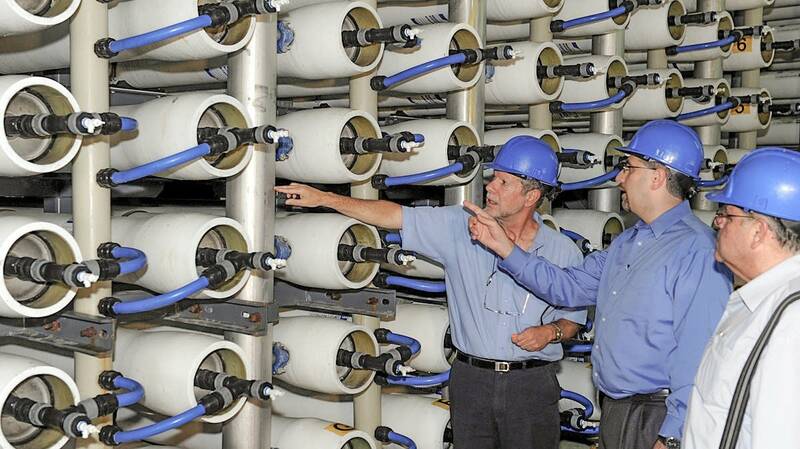 The retired head of desalination for the Israeli government dismisses the criticism. "The amount of water in the world is a fixed number, it doesn't change," Abraham Tenne said. "But the population is growing and we still have the same amount of water — most of it seawater. So we're trying to get the most cost effective means of providing water." Israel's population is expected to grow 65 percent by 2050 and so will water demand. He said the cost of desalinating water, borne mainly by consumers in the form of higher water bills, is negligible in the face of political and national security pressures from within Israel and from neighbors in the Middle East. He added that the price of desalinated water is likely to go down over time. "If you do not have enough water you cannot have a state," Tenne said. "When you need something to survive, you'll pay anything." One of the key differences between Israel and other counties — including the United States — is who owns the water. Depending on where one lives in the United States, landowners generally have rights to use water under their land. Laws vary, but in many states landowners have certain rights to rivers and lakes that adjoin their property. In Israel, water belongs to the state. "There is a law: you cannot touch the rain that falls on your roof," said Amir Givati, the head of surface water management for the Water Authority. "To drill a well without permission is against the law. It sounds severe but it gives us the ability to manage water much more efficiently." Israel has one central water authority and one central water supplier. According to the federal Environmental Protection Agency, the US has some 155,000 separate public water systems. Gal Shoham is proud of his sewage water, which, it turns out, is another water source Israel has tapped through engineering. 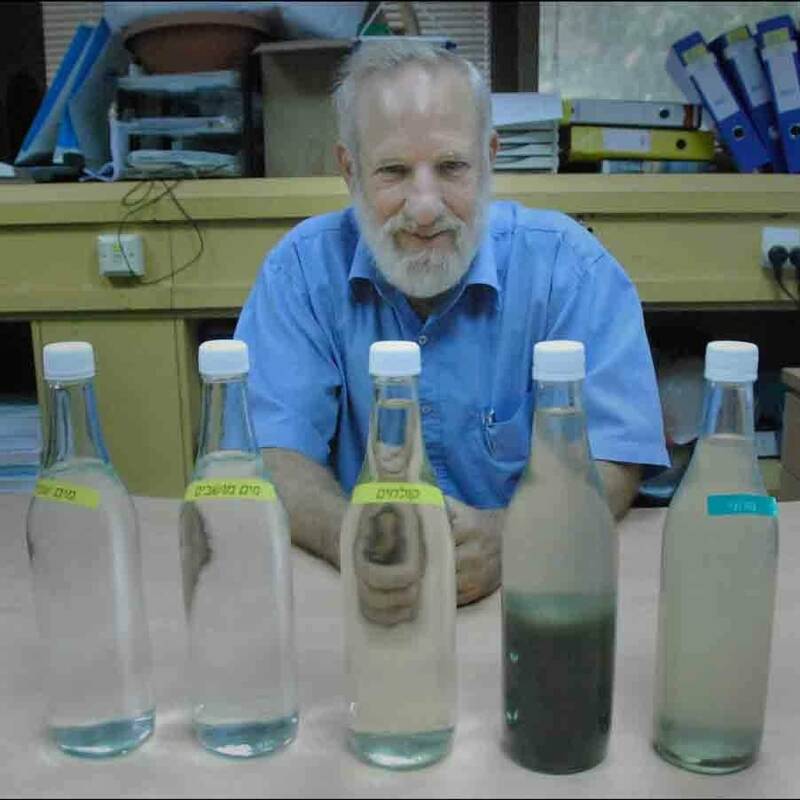 An engineer at Israel's Shafdan wastewater treatment plant south of Tel Aviv, Shoham lined up five, half-liter bottles on his desk to demonstrate how the water is reclaimed. The first bottle held sewer water, a gritty brown brew with a thick layer of sediment at the bottom. Wastewater enters the plant and goes through a filtering process, then sloshes around in pools of microbes and bacteria that digest the organic pollutants. Next it goes to a sediment basin where the liquid is separated from solids (some of the remaining sludge contains heavy metals and is buried as hazardous waste; the rest is spread on farmland.) Finally, the cleansed water flows to a set of sandy fields where it slowly percolates down to a storage system, removing any last impurities. After a year, the one-time sewage is clear and clean, as evidenced by bottle No. 5 on Shoham's desk. The water is potable, but no one drinks it. Instead, the plant takes wastewater from the Tel Aviv metropolitan area, cleans it up and pumps it south to the Negev desert, where it is used to irrigate more than 60 percent of the Negev's agricultural production, from peppers to celery to cherry tomatoes. "We are the biggest plant in the world doing this process," Shoham said. "And without the water that comes from this place, there is no agriculture in the south of our country." Some 85 percent of Israel's wastewater is reclaimed for agriculture. Spain has the next closest water irrigation scheme at about 25 percent, the United States reuses about 6 percent of its treated wastewater. Water engineers from around the world come to Shafdan to observe. And in spite of the tangy stink in the air, Shafdan is also a popular Israeli tourist destination. Conferences, corporate board meetings and even weddings have been held there. The visitor's center welcomes 37,000 people each year. Admission is $4. Some water innovations, provoked by scarcity, have become big business in Israel. Ruth Keren was 19 years old when she went to live in the desert. It was October 1946, before Israel was established. Young members of the Israeli underground resistance hiked a few miles from the town of Beer Sheva across the Negev, moving at night to avoid the occupying British security forces and carrying barbed wire for a fence on their backs. The next day, a squad of about 30 plus several hundred volunteers slapped together two huts and a dining shack. The plan was to establish a socialist-style community, known as a kibbutz, before the British could stop them. They called it Kibbutz Hatzerim. "There was just one tree and nothing more," Karen recalled. It was an acacia. "One tree. And wherever else you could see there was nothing." Over time, the kibbutz would become one of the largest producers of drip irrigation systems in the world. This water-saving technology delivers water and nutrients directly to the roots of a plant without soaking the rest of the ground. Developing drip irrigation was a matter of necessity. In the Negev, summer temperatures often reach 100 degrees. Annual rainfall can measure less than 7 inches. (By comparison, yearly rainfall in Iowa farm country is about 35 inches). Kibbutz Hatzerim was established as a collective farm. Water was piped in from the north, but the quality of the desert soil turned out to be a serious problem. "We found that we are sitting on deep layers of salt in this soil," said Uri Werber, 85, who moved to Kibbutz Hatzerim in 1950. "The kibbutz was in very bad shape. The income from agriculture was small." The community's olive plantation grew fine looking trees that produced little fruit. The kibbutz tried other crops that also failed. Some residents gave up and left. But after years of struggle, the kibbutzim voted to seek out some sort of industry to help them stay afloat, a place where women and older residents could work. Werber was the kibbutz treasurer at the time. He had heard about a water engineer named Simcha Blass who had developed an offbeat idea for how to irrigate crops more efficiently. In a filmed interview in the 1970s, Blass recalled visiting a farm in another part of the country and seeing a line of trees where one had grown exceptionally tall. On closer inspection, Blass discovered that a water pipe passing near the tree was slowly leaking, giving the big tree water while the rest of the soil was dry. Years later, Blass and his son tinkered in his Tel Aviv basement to come up with a functional drip irrigation system. A number of potential investors turned Blass away. But Werber and his colleagues at Kibbutz Hatzerim liked the idea. Netafim is the company the kibbutz launched to manufacture Blass' plastic irrigation pipes and drippers. It now has factories and offices in more than 110 countries, with significant operations in India and the United States. "At the beginning it was hard to believe that, just by slow dripping next to a tree, you can actually satisfy the needs of the tree," says Netafim Chief Sustainability Officer Naty Barak. The drip system also seemed to create a sort of barrier against soil salinity. "We grew apricots, pears, peaches, and the results were amazing," Barak says. Worldwide, Netafim drip systems now irrigate big farms that grow water-hungry crops like corn in Mexico and sugar cane in Brazil. The company also sells drip systems to small farmers in economically poor regions such as sub-Saharan Africa. Today, Kibbutz Hatzerim uses drip irrigation for its major crop, jojoba beans, whose oil is widely used in cosmetics. Farm equipment would destroy a surface irrigation system, so in the 1990s Netafilm developed a subsoil system for the kibbutz, said its chief agronomist, who goes by the name Rogi. Globally, 80 percent of the water used in agriculture is delivered by conventional "flood" irrigation, using canals, ditches, pipes, sprinklers and the like. Half that water never reaches the crop. The rest evaporates, runs off or gets absorbed in unproductive soil. This frustrates Barak. "Everyone is talking about water scarcity," he said. "Flood irrigation is wasting water. You basically irrigate the soil and you don't irrigate the plant." 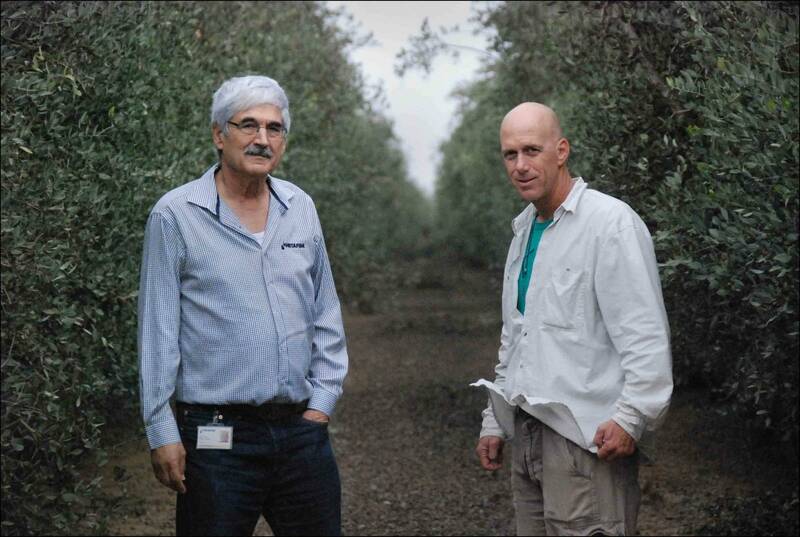 Netafim's drip irrigation business helped Kibbutz Hatzerim not just survive, but thrive. The residential campus is a verdant patch of grass and flowers blossoming in the desert. Old-timers like Warberg are grateful for the abundance. They are also mindful of what drip irrigation can do to help other water-starved parts of the world. "I am proud," Warberg said. "I think we did something good for humanity." Many Palestinian residents of the West Bank and Gaza do not enjoy the same water security as their Israeli neighbors. Israel's national water company, Mekorot, provides 50 percent of the water used in the West Bank, which the Palestinians pay for. The rest comes from groundwater sources. While many of the commercial and residential buildings in Palestinian communities are connected to a water grid maintained by the Palestinian Authority, the supply is not always reliable. Many neighborhoods are on a rotation schedule and get water only once or twice a week. When you cross into the West Bank city of Ramallah from East Jerusalem, you notice that most buildings have sprouted rooftop tanks for water storage. In other parts of the West Bank conditions are much harsher. Some areas are under Israeli military control, and that includes water infrastructure. Palestinians there can't develop their water resources without Israeli permission, which Palestinians complain is very hard to get. At a Bedouin family encampment in the Jordan River valley, 35-year-old sheep herder Salem Hammoud Gadini and his brother haul a water tank by tractor once a week to a privately owned well where they say they pay $50 for a fill-up. The family has 13 children and, like many semi-nomadic Bedouins, lives in tents. 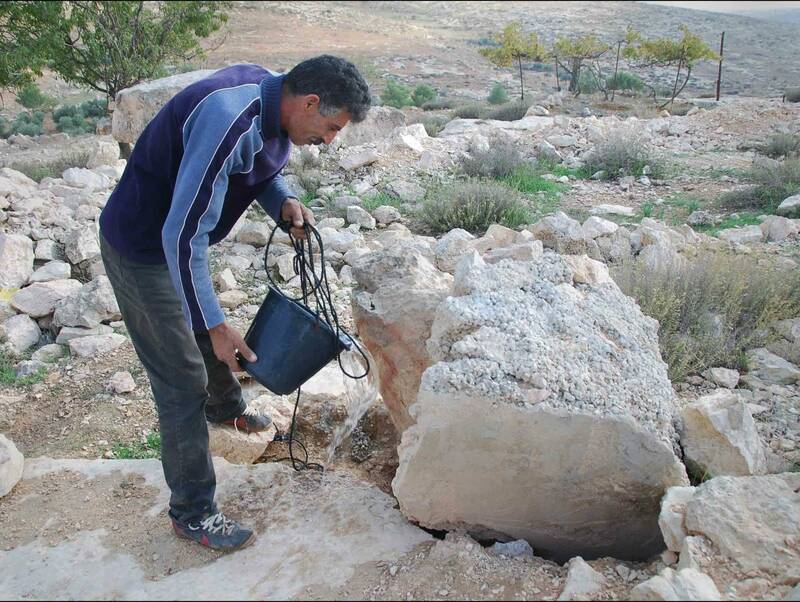 There is a brackish spring on the property that could benefit their sheep, but because the family lives in an area under Israeli military control it needed permission to fence in the spring to keep the animals out and the water clean. The permit was denied, but they put up fencing anyway. Gadini said the Israeli Defense Force tore the fence down and fined the family. "This landscape is not so difficult for us to live in," Gadini says. "But the Israelis make it difficult." A settlement of Israeli Jews across the valley is a patch of green in the kakhi landscape. That community gets water from a pipe that crosses the land where the Gadinis live. It's about 30 yards from their tent. The water issue is a major thread of disagreement and politicking that runs through the decades-long conflict between Israelis and Palestinians. In the 1967 war against Jordan and Egypt, Israel occupied the West Bank and Gaza. By doing so it also became the governmental authority in charge of the population living there, the Palestinians. But since the war, hundreds of thousands of Jewish-Israelis went to live on parts of that land. The settlements are widely viewed as illegal by most other countries. In 1993, a set of agreements between Israel and the Palestine Liberation Organization, the Oslo Accords, signaled the start of a peace process that was meant to lead to Palestinian self-determination in the territories. Most Palestinian towns and villages were handed over by Israel to the newly established Palestinian authority. Water rights and obligations covering Israel and the Palestinians were a fundamental feature of the Oslo agreements, which have still not been finalized. However, many Palestinian areas and the people living there, mainly around Jewish settlements, remain under Israeli control. The settlements are widely viewed as illegal under international law. In the parched West Bank village of Susya, about 40 Palestinian farm families buy trucked-in water while neighboring Jewish settlers have piped water and green lawns. Susya is in a part of the West Bank called Area C. Under the Oslo agreement, Area C is under the complete control of Israel. It makes up more than 60 percent of the West Bank and is also where the Jewish settlers live. Azam Nawajaa is a member of the local Palestinian community council whose family of seven lives just 100 feet from an Israeli-controlled water line. He said he paid 10 times as much for water as the settlers connected to system. The village has several wells, but Nawajaa said Israeli soldiers scuttled them for being used without a permit. They blocked the opening to one well with concrete. In another, he said, the soldiers heaved in an old car that leaks fuel and oil. When villagers try to build unpermitted rain collection ponds the authorities issue a demolition order. Many Palestinians have simply tapped into the water system illegally. "Because of the water problem life here is nearly impossible," Nawajaa says angrily. "In the past, each family here had 200 sheep or more. Today it's only 20 or 30. We don't have enough water." A spokesman for Israel's Water Authority, Uri Schor, noted that Israel sells the Palestinian Water Authority nearly twice the amount required under Oslo accord. He said the Palestinian Water Authority is not nearly as aggressive at recycling wastewater as it should be, the result being pollution of streams and aquifers. It could increase its water supply 30 to 40 percent by recycling wastewater, Schor said. "They can do it." Some Israelis, especially on the political right, accuse the Palestinians of exaggerating their water problems in order to gain sympathy from the rest of the world. Professor of Hydrology Haim Gvirtzman of the Hebrew University of Jerusalem pointed out that when Israel took control of the West Bank after the Middle East war of 1967, known as the Six-Day War, it built the water systems in what are now major Palestinian communities, such as Ramallah. Gvirtzman said the Palestinians should be grateful. "Israel, by means of water, is an empire," Gvirtzman said. "They are lucky to live next to the empire. And to have standards of living like what we have. No such conditions exist in all the Arab countries around." Deeb Abed Al-Ghafour, an official with the Palestinian Water Authority, acknowledged that sewage is a problem in the West Bank. But he said that building or expanding treatment plants requires the cooperation of a joint water commission comprised of Israelis and Palestinians and that the necessary permits simply don't get approved. "We care about wastewater and we know we have to solve any remaining problems of pollution," Al-Ghafour said. "It's hard to implement under the occupation. Frankly, in my opinion, there is no real development of this under the occupation. You cannot achieve it." While the water dispute continues between the Israeli government and the Palestinian Authority, water has become a stabilizing force in relations between Israel and its neighbor to the east, Jordan. The two fought the Six-Day War in 1967, in part, over access to the Jordan River. But in recent years have entered into water agreements that proponents at the World Bank said would benefit both countries. In a 2015 pact, Israel agreed to provide Jordan an additional 13 billion gallons of water annually from the Kinneret. Jordan, in turn, would build a $900 million desalination plant and draw water from Gulf of Aqaba on the Red Sea. Under the agreement, water from the plant is to be shared by the Israelis and Palestinians. The briny byproduct of the plant is to be pumped 112 miles to the Dead Sea, which has been drying up in recent years. A previous version of the story incorrectly identified the senior director for technical solutions and products at IDE. Her name is Miriam Faigon.